It hit me — a lot of things we know and take for granted as adults, kids don’t always understand yet. I had to explain that a name-brand product is one you know — it’s advertised on TV, the Internet and anywhere else products are advertised nowadays. We went to Target, and we walked around the store looking for five products to compare. His picks were cinnamon, penne, green beans, creamy peanut butter and gallon freezer bags. You know, all the typical stuff. He wrote the item and size, the price for the generic product and the price for the name-brand product. In some cases, the name-brand product was on sale, so he wrote the sale price and then the regular price. While we walked and wrote, we talked about comparing like products (making sure the size and type were the same) and how to read the price tags on the shelves carefully. I allowed enough time for the activity so that we weren’t rushed and only chose five products so that it wasn’t a chore to do. I think J enjoyed the trip and conversations (when he normally doesn’t like going to the store). In mostly all cases, the generic product won out on price. In one case, the regular product won because it was on sale (cinnamon) and in another case, there was a tie (peanut butter) — again, because it was on sale. Lesson: Don’t just assume the generic brand is cheaper. Always check the prices! However, we compared penne as well. To me, there’s no noticeable difference between Target brand penne and Barilla, so I’m fine buying the generic version. Lesson: Don’t buy something you don’t like just because it’s cheaper. It’s not actually cheaper if you don’t use it. Lastly, we discussed quality. None of the items we looked at had quality issues, however think about products like toilet paper, paper towels and tissues. I know I’ve bought generic versions of these before and have been dissatisfied with the quality. Lesson: If you don’t like the quality of a generic product, spring for the brand name. Again, it’s not actually cheaper if you never use it and it’s not worth hating something you buy just to save a little bit of money. How does it go in your house? What do your kids see you doing? 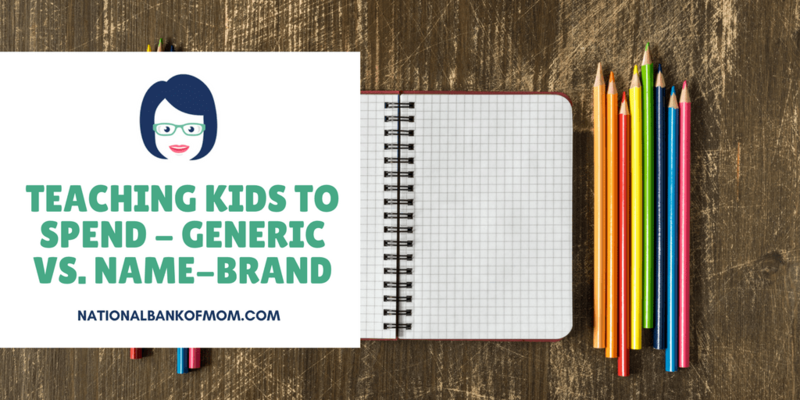 Do you buy generic? Why or why not? Want to try this activity for yourself? Download the free template. And don’t forget to join us next time when we talk about comparing prices between stores!